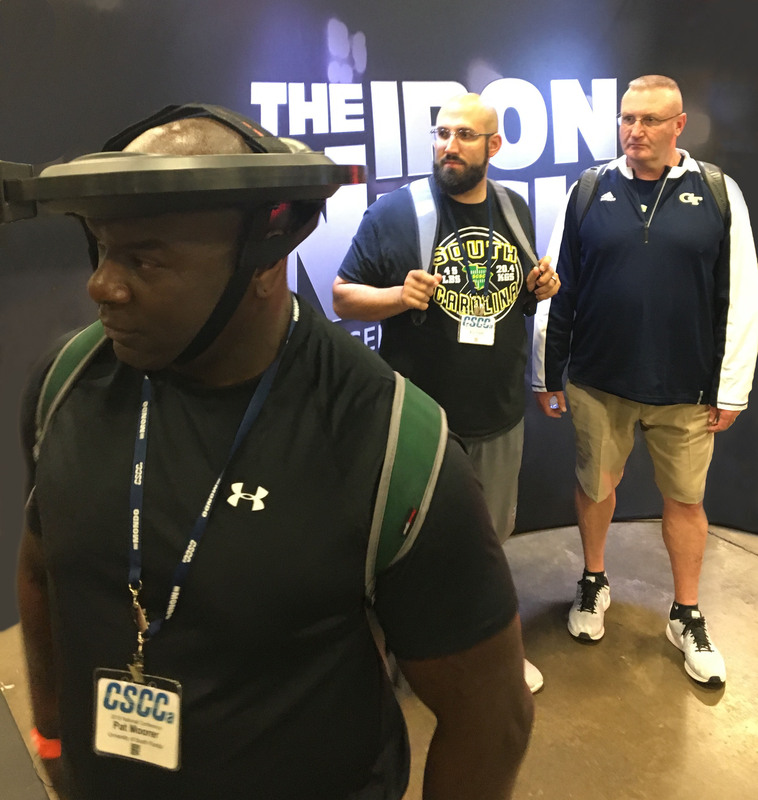 Strength and conditioning coaches Pat Moorer (University of South Florida) and John Sisk (Georgia Tech) demo the new Iron Neck at the 2018 CSCCa. Over the coming weeks, we'll be sharing a series of innovative exercises and lessons learned from coaches who have been implementing Iron Neck. We hope this content will instill a sense of inspiration and creativity in you and your athletes and arm you with the most effective strategies and techniques to implement Iron Neck efficiently across all sports, for boys and girls. 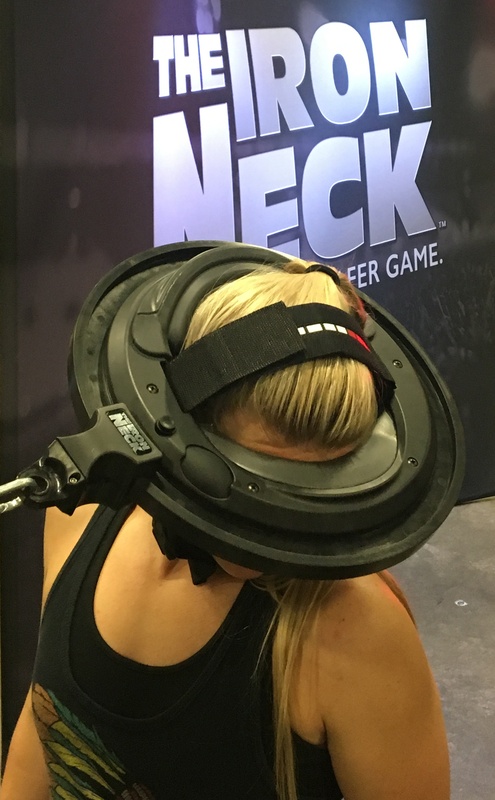 When Iron Neck was first introduced at the 2012 CSCCa, discussions with some coaches about neck strength reducing concussion risk were met with skepticism. Today there is a consensus in the research and coaching community, especially regarding youth and female athletes. What started as a $1000 13 pound metal ring is now under 3 pounds, half the price and comfortable enough for 60-somethings in rehabilitation clinics! 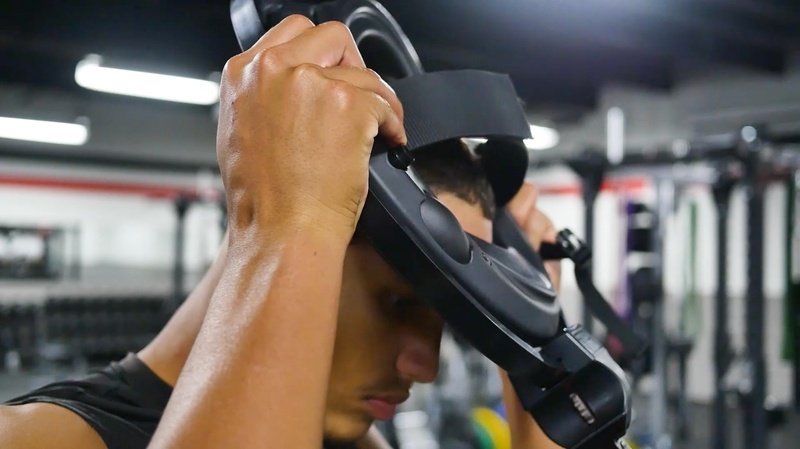 "The technology is the same but the product has been completely redesigned, working closely with some of the early adopters in college football and the NFL," says Mike Jolly, inventor of the Iron Neck. "What we have been really good at these past five years is listening to the coaches and improving the product based on their needs and their ideas." Female Neck Training: "We need to be better about it." Men and women are not built the same. Females have longer, thinner necks more susceptible to whiplash and have half the isometric neck strength as males. Yet at this year's CSCCa, the most common response we heard from strength and conditioning coaches about neck training for their female athletes was, "we need to be better about it." We intend to change this by making neck training easier to do correctly, more approachable and far more efficient (Click here to see what high school and college coaches are saying). "Improving the fitting system to be more comfortable on the head has made female coaches and athletes far more interested and open to introducing it into their programming," says Jolly. Stanford is one of the latest college programs that purchased Iron Necks to be used by every varsity athlete, not just for football. Remember, concussions aren't a football problem. Interested in demoing the Iron Neck? We've made it easy for you. Just complete our Demo Sign Up Form and we can ship you an Iron Neck to test for 30 days. We have learned a lot from the best strength and conditioning coaches and athletic trainers in the world and are exciting to be sharing it with you over the coming weeks and months! Have any questions? Please feel free to email support@iron-neck.com or call us at 509.312.0416.